Luscious Little Cottage was built in the 1920s as housing for the Corps of Engineers who were building the road to Tybee (prior to the '20s, the only way to reach Tybee was via train) and is on the National Register of Historic Places. Owned by the Heriot family until the heirs decided to sell it to Jane (whose wish was to protect the remaining streetscape of the cottages), the cottage lies next to another Jane Coslick Restoration, 99 Steps to the Beach-- literally steps to one of the quietest and most beautiful stretches of Tybee beach. Luscious Little Cottage is a one room cottage which comfortably sleeps three with a building out back called "The Roost"-- a restored elevated ticket booth with twin beds made of old driftwood from Tybee beaches. A true Jane Coslick outdoor shower completes the picture. The property is near the end of a quiet road with a private walk through the dunes to the beach. The main cottage and Roost were fully renovated throughout in 2008 to include central heat and air, a modernized kitchen and bathroom, and washer/dryer. The cottage has 9 original pocket windows for light and breeze, a vertical half-wall divider for privacy in the Queen bed area, and a day bed for reclining and watching the ocean and the ships pass into the Savannah harbor. Lots of local, colorful art throughout, and vintage Carlton Varney fabrics on the slipcovered chairs. An old platform rocker with striped slipcover, simple white curtains with the ocean breeze blowing through, and a Tybee shipping crate as a coffee table are some of the fun accents. Colors are everywhere for contrast with the fresh whites. 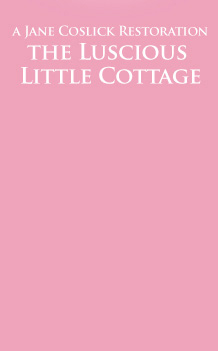 Luscious Little Cottage is truly a one of a kind experience loved by writers, artists and fairy princesses.